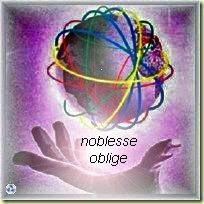 I received this Noblesse Oblige award from my online pal Enchie, mommy extraordinaire and author of Sweet Nothings. Thanks dear for this award... it is such an honor. As some of you may know, I started this blog last year, thanks to a friend who convinced me to give it a try. I don't have a particular topic in mind so I decided to call it Just About Anything. It would then contain a mix of various topics from travel to Japan facts, which later on evolved into a personal online journal which contained my musings and passions in life and my journey with my family. This blog then lay dormant and inaccessible for more than a month due to some domain problems but was reborn last month, thanks to all the efforts of that same friend who convinced me to blog. Now, I am back and enjoying blogging more because of the great mommies and friends I met online. I think I can say that I've come a long way since then. Many thanks to ALL of YOU, my dear readers and friends who take the time to visit and comment, and the various blogging communities that I have crossed paths with. 2. The Blog contents inspire; strives to encourage and offers solutions. 3. There is a clear purpose at the Blog; one that fosters a better understanding on Social, Political, Economic, the Arts, Culture and Sciences and Beliefs. 3. Write a short article about what the Blog has thus far achieved – preferably citing one or more older Post to support. Now it's my turn to pass this on to all my friends in my bloglist. You all deserve this honor for meeting the five conditions listed above. You all are great, inspiring and creative! I am thankful that I met you all! Take care and have a wonderful Thursday. You deserve it hardworking Mommy…have a great weekend ahead!! !